Hundreds of white Dutch dress up in blackface to celebrate the nation’s treasured “Sinterklaas” holiday. A growing movement says it’s time for that to change—but many Dutch don’t want to hear it. Each November, as Americans fill up on cranberries and stuffing, the Dutch fight back the dark winter with a holiday of their own. “Sinterklaas” has roots in Christianity—Sinterklaas himself looks like a slimmer, mitre-wielding version of Santa Claus. But over time, the holiday has evolved into a secular family event that begins in mid-November and culminates on December 5, with a night known as pakjesavond (“packages evening”), when families and friends gather to read poems they’ve written about each other, give crafts they’ve made and exchange gifts. For families with young children, the festivities peak when Sinterklaas and his helpers deliver a bag of presents. The best part is that everyone’s in on it. For three weeks, the entire country—nearly 17 million people—conspires to convince its youngest inhabitants that something magical is afoot. Parents, grandparents, teachers, neighbors and older siblings keep alive the generations-old story that Sinterklaas and his helpers have arrived in the Netherlands from Spain. A nightly newscast even updates children on “Sint’s” adventures. There’s a hitch, though: the Sint’s helpers, called the “Black Petes,” are white Dutch coated in blackface paint, lips painted bright red, topped by Afro wigs, with light-colored eyes peering out from their darkened faces. They “arrive” on a steamboat with Sinterklaas in droves, first at the national parade, then in city after city, clad in colorful satin costumes with white ruff collars and feathered hats. Though some parents explain that Pete is blackened by coal dust as he climbs down chimneys, in Jan Schenkman’s 1850 book Saint Nicholas and his Servant, which is widely regarded as the source of most modern Sinterklaas traditions, Black Pete is a servant who helps Sinterklaas on the journey from his home in Spain. After delivering presents, in generations gone by, Black Pete put naughty children in burlap sacks to take them back to Spain. Gario, who grew up in the Netherlands and Saint Martin, protested—and got arrested—at the national parade in 2011 in Dordrecht with artist Kno’ledge Cesare. In 2012, he and Barryl Biekman of the National Slavery Heritage Platform, an organization dedicated to keeping alive the memory of the Dutch slave trade and colonial slavery, gave the United Nations Office of the High Commissioner for Human Rights a file of information about Black Pete, triggering the UN’s 2013 inquiry into the tradition. Last year, he initiated a campaign to file complaints against the Amsterdam Sinterklaas parade official. One year later, the mood has shifted. Hema, a Dutch Target-like chain, is one of several national retailers to downscale Black Pete in its holiday packaging and inventory. 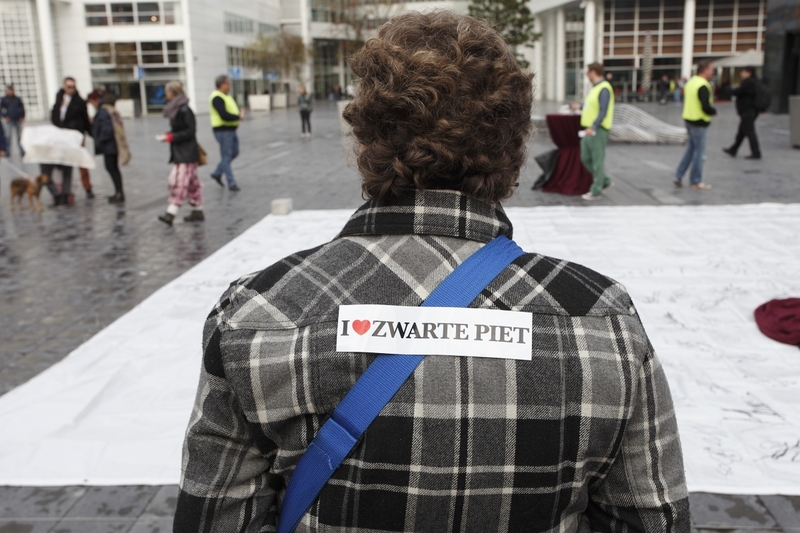 On Facebook page Pietmakeover, many famous residents of the Netherlands are calling for Pete to stay—without the blackface. Well-known author Robert Vuijsje is promoting this idea with his new picture book, in which children who want to dress up as Black Petes realize they might as well use any color face paint. “Cheese Petes,” “Dutch Waffle Petes,” clown Petes and even a few Petes without face paint joined traditional Black Petes at the national Sinterklaas parade in Gouda on November 15. The next day, about quarter of the Amsterdam parade’s Petes looked sooty, rather than black, and the parade bypassed part of the city in deference to anti-Pete sentiment there. Meanwhile, the issue continues to play out in court. Gario is one plaintiff in a lawsuit asserting that the city of Amsterdam should not have been allowed to hold its Sinterklaas parade last year. Though a judge ruled in July that Black Pete is “an infringement on the private lives of black people,” Amsterdam Mayor Eberhard van der Laan and the Pietengilde, a group of roughly 600 Dutch who dress up each holiday season as Black Petes, appealed; on November 12, the Council of State, the country’s highest appellate court, overturned the ruling, stating that in issuing a permit for a parade, the mayor only has to determine if the event will endanger “public order and safety.” The court concluded that the Mayor is constitutionally prohibited from evaluating the “content” of an event. 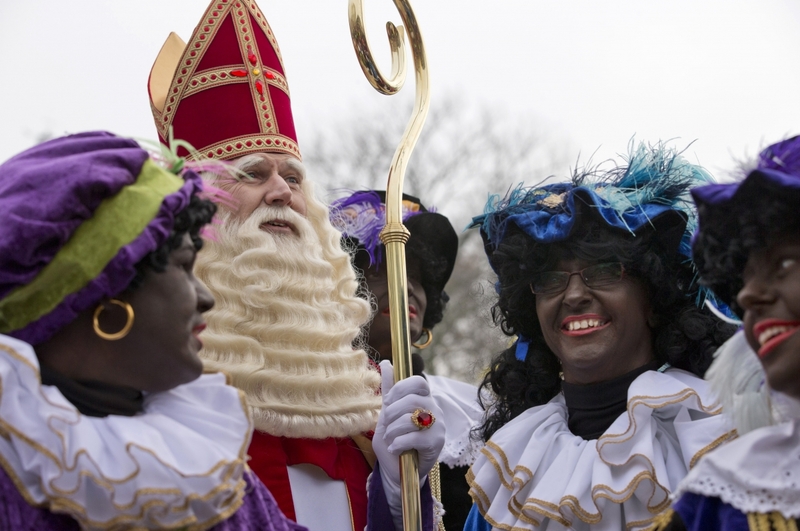 But it declined to rule on whether or not Black Pete is discriminatory, adding that this could be decided in a civil court case against the organizers of the Sinterklaas parade. Though it’s clear that businesses and some whites are rethinking Black Pete, the court appeal shows that many Dutch don’t see anything wrong with the tradition. The retailers’ announcements that they would curtail Black Pete set off boycotts; the right-wing political party Livable Rotterdam hung hundreds of Black Pete rag dolls throughout the city. Most Dutch think “ ‘We have this great folkloric figure, we don’t think it’s racist; we just want to have our party,’ ” explains Gert Oostindie, professor of Caribbean history at Leiden University and Director of the Royal Netherlands Institute of Southeast Asian and Caribbean Studies. He compares the clash over Black Pete to what would happen if an ethnic group living in America pushed to ban turkey from the Thanksgiving table. Because the intention is just to have fun, he says, most white Dutch struggle to understand what’s wrong with a little blackface paint once a year. Acknowledging and accommodating people’s unique circumstances and backgrounds challenge this small country that, until the 1960’s, was predominantly white and Christian. The biggest differences among people were politics and religion—meaning Protestant versus Catholic. Groups rarely mixed; each had its own churches, schools and sports clubs, leading parallel but largely separate lives. Dutch political scientists call this self-segregation “pillarization”—and the Dutch word for it, verzuiling, is in common use. “You do what you do, as long as you don’t want me to change anything that I do,” describes Philomena Essed, professor of critical race, gender and leadership studies at Antioch University. Pragmatic, voluntary segregation is the root of Dutch tolerance—not the creation of a liberal, everything-goes-and-everyone’s-welcome utopia that many outsiders imagine. By protesting the Black Pete tradition, Essed says, activists demanded that others not stay the same, breaking an unspoken rule of tolerance. But there’s more to it. A big part of Dutch identity is the pride of being “an exceptional people:” a country that emerged from its colonial past without legally enforced differences between blacks and whites. 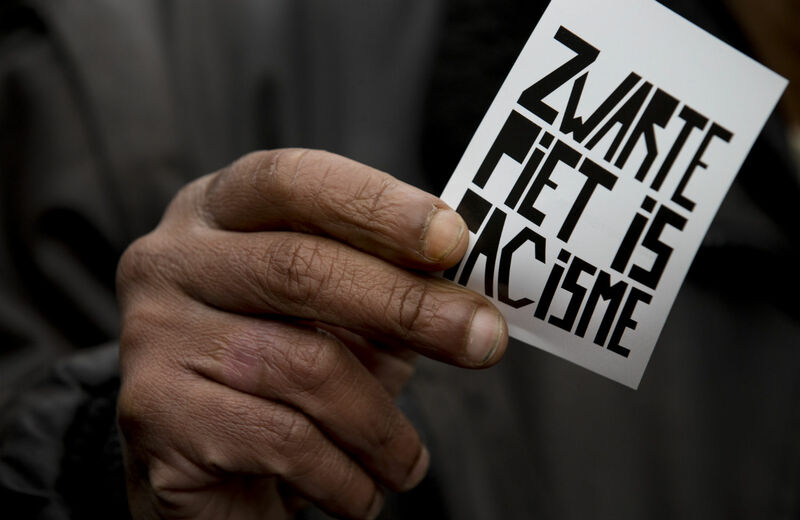 Racism “touched the world, but skipped over the Netherlands” is how many Dutch think of their history, says Essed. What “the Netherlands” stands for in 2014 is at the heart of the Black Pete debate. Van den Broek says that describing Black Pete as “our tradition” itself reveals the problem: Modern racism in a multicultural society often takes the form of normalizing a subset of citizens at the expense of others. “It’s about belonging,” she says. And the current definition of who belongs is narrow. Of the Netherlands’ 16.8 million residents, nearly 3.6 million are considered allochtoon; according to Statistics Netherlands’ official definition, an allochtoon is a Dutch resident born outside the Netherlands, or with at least one parent born outside of the country. In fact, a Dutch person can be a citizen and still be allochtoon. In daily life, allochtoon has a more sinister meaning than its official one—“dirty foreigner” might best express it. Most people’s image of an allochtoon is of those labeled “non-Western:” residents with Turkish, African, Latin American or Asian roots. Western European and North American foreign nationals generally dodge the label and its negative connotations. Anousha Nzume is ready to talk. The columnist, actress, and co-founder of Pietmakeover was born to a Russian mother and a father originally from Cameroon. Nzume grew up in the Netherlands and always felt “uncomfortable” with Black Pete. She never liked the tradition, but got the message that “You should enjoy it.” She came out publicly against Black Pete only when her son came home and said, “I don’t like to be called Black Pete.” That, and the “complete silence by the Dutch media when all the hatred was being poured down our throats” in the wake of the UN investigation. “I can’t shut up anymore; it is my battle,” she says. Polls suggest that somewhere between 83 and 96 percent of Dutch want to protect the Sinterklaas holiday, including Black Pete. The Dutch Center for Folk Culture and Intangible Cultural Heritage (VIE) is an organization dedicated to placing Dutch traditions and rituals—everything from flower boat parades to the miller’s trade—on the Dutch inventory of living heritage. VIE Director Ineke Strouken says that the organization wants to include the Sinterklaas holiday on this list, but delayed its decision until after the November 12 verdict. Discussion of the issue will resume this week, she says. Like many publicly involved in the Black Pete conflict, Strouken has received hate mail and death threats. Recently, a man repeatedly punched an anti-Pete activist in the face. Amidst the flurry of threats and heated public debate, many are calling for moderation, the cultural norm. Emotions have run so high that in the weeks leading up to the national parade, anti-Pete protestors trained to respond peacefully to physical aggression. The atmosphere at the Gouda parade on Saturday was tense; Mayor Milo Schoenmaker called it “grim.” A number of parade-goers declined black face paint in favor of the red, white and blue Dutch flag, and scores of anti-Pete activists gathered silently on the market square, where they’d been forbidden to protest. The day ended with ninety arrests. Though most of those arrested were oppose Black Pete, several were spectators who had lost their temper and gotten into a scuffle with anti-Pete activists. This charged beginning to the Sinterklaas season has the Netherlands clinging fiercely to its self-image as a country defined by peaceful race relations, hoping that things don’t escalate further. Heather Beasley DoyleHeather Beasley Doyle is a freelance journalist based in The Netherlands, where she has lived since 2008. She has contributed to a variety of English-language publications, including Al Jazeera America.